Black Science is where the pursuit of knowledge meets anarchist abandon. No technology or taboo is off limits for these zealous scientists, and anarchist scientist Grant McKay has invented the "Pillar," a device that can punch through time and space, dissolving all barriers to the multiverse. Black Science is where the pursuit of knowledge meets anarchist abandon. No technology or taboo is off limits for these zealous scientists, as scientist Grant McKay has invented the "Pillar," a device that can punch through time and space, dissolving all barriers to the multiverse. 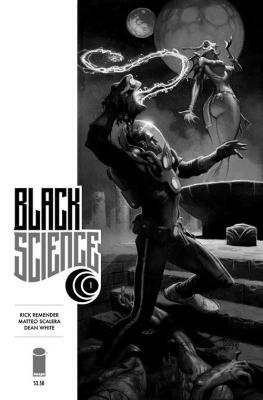 It should also be noted that Black Science is a comic written by Rick Remender and drawn by Matteo Scalera and published by Image Comics. But first, I'll truthfully admit it: I'm often ashamed of my lack of comic book consumption. I self-affirm as a nerd and geek and relish in the delights of all that that entails, however, comics, for me, were always daunting. Sure, that might sound silly, but hopping in at the middle of any Marvel hero storyline is like thumbing to a random spot in Homer's Odyssey and starting there. There are stacks of older issues, crossovers, and one shots that need to be read to get the full story. In short, it can be a bit overwhelming. It's because I have a compulsive nature that many self-affirmed nerds share. We want to consume all there is on a topic and have a near encyclopedic understanding of the things we love. When it comes to comics, I would dabble in grabbing an issue here and there of my favorite superhero, but this usually led to a frustration to not have ALL OF THE THINGS right then and there. This is where comic book publishers like Image and series like Black Science have my number. First, they are newer and only have maybe a dozen or so issues published. Typically they bind them together in groupings and call them trades. I believe these were designed for folks like me who have a ravenous hunger for excellent media to consume. Second, Image, and other comic publishers like it, are aimed more towards adults, and because of that, often deal with more mature themes. Rick Remender, who writes Black Science, is no stranger to the industry. Previously, he wrote Fear Agent, which is widely considered the precursor to his latest work. He also wrote for Marvel, penning the Uncanny X-Force. X-Force is an offshoot of the X-Men series where Wolverine sets up a hunter-killer squad to do the dirty work that the X-Men can't stomach. Remender's writing in Black Science reminds me of wonderful science-fiction pulp of the '50s. I am a fan of Ray Bradbury and couldn't help but sense a connection to his works, like the Martian Chronicles. Black Science also has a morbid Swiss Family Robinson aspect to it as well. The main character Grant is with his colleagues and his kids when his invention, the "Pillar," malfunctions and teleports them to a new dimension. In the first issue alone there is a race against time and mortal losses. Remender isn't afraid of killing characters in the same refreshing way that George R.R. Martin isn't in the coveted A Songs of Ice and Fire (read: Game of Thrones). Sliders, the '90s TV show, is an apt comparison to the plotting of Black Science. Each issue is carefully encapsulated in the time it takes to jump from one dimension to the next. With each successive jump the plot thickens and the hope of ever returning to their time and their world grows grimmer. But as a reader, we get to visit a world where a Nazi Regime is decimated by an alien technology-armed Native American super-army riding cyborg stallions. We get to see serpent men wielding tridents fight with enormous frog people with electric whip tongues. It's fantastic and wild, and it's exactly what I love about comics. Since Grant McKay is separated from his wife and home, protecting his children has become his sole purpose. Much of his inner turmoil is dealing with his obsessive work ethic of building his machine and how he has become estranged to his wife and children – all of it exacerbated by the fact that his creation was sabotaged by someone working close to him. With these issues of family, work, love, and corruption at play, Black Science gives the reader plenty to chew on as you thumb through this beautifully illustrated comic. I enjoy this series because finally, I can be there from the beginning, travel across the multiverse, see the everyday struggles of many be blown up into larger-than-life science fiction, and enjoy a medium in the way it was meant to be enjoyed. John Linvday can be contacted at jLindvay@ErieReader.com, and you can follow him on Twitter @FightStrife.